Solar panels: they’re all the same, right? Er…let’s take a walk through the maze of things you have to consider. There’s a bit of unavoidable jargon here, so we promise we’ll lead you out the other side. Over 20 years, the difference in energy generated between the lowest & highest quality solar panels is 40%. Many factors affect solar panel performance and durability. Below, we answer common questions and slay a few myths. All solar panels are made in the same factory, aren’t they? Definitely not. We’ve seen many different qualities of solar panel come through the UK market and there’s some we’d recommend you definitely avoid, including some from very big household names. There’s a lot of smoke and mirror tactics used to convince you that certain panels are the best. We look at the whole market and check all manufacturers’ claims. Here’s our guide on how to become a Solar Panel detective. 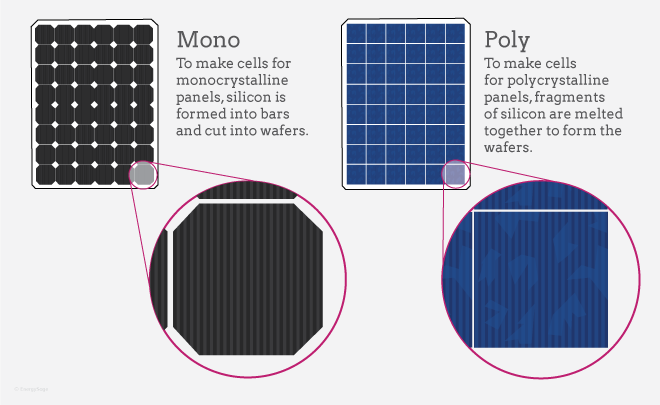 Mono Solar panels are better than Poly…right? True. Sort of. Mono crystalline panels give you a bit of extra power per square metre, but there are many other factors that affect performance. So a good quality Poly solar panel will generate more than a poor quality Mono. Poly crystalline: This technique uses fragments of silicon crystal melted together. Poly is an older technology, cheaper to produce and has a blue shade to it. Because there are edges where the crystal fragments meet, there are small areas that are not perpendicular to the light hitting the panel, meaning they don’t absorb energy, resulting in slightly reduced efficiency. Mono crystalline: With Mono, wafers cut from a single ‘ingot’ of silicon crystal, making the surface of the crystal flatter. Light hitting the panel is therefore perpendicular to the surface. This increases efficiency, allowing you to have more power in a smaller area. Solar panels are sized in kWp (kilo watts peak) which refers to their performance under STC (Standard Test Conditions). However you need kWh (kilo Watt hours = units of electric) as the more kWh your system generates the bigger the impact on your bills and the more Feed in Tariff you’ll be paid. So what affects solar panel performance in conditions outside of STC? Low light level performance: When the light level drops, better quality panels will maintain more power. This is affected by the quality of the silicon and the clarity of the glass. Temperature co-efficient: Everything electrical increases in resistance the hotter it gets. Increased resistance means reduced efficiency. Panels with a lower temperature co-efficient are affected less by increases in temperature and are more efficient. Heat capacity: If a solar panel can dissipate heat better it will give better results at high temperatures. So even if a panel has a good temperature co-efficient, it may perform badly if it can’t dissipate heat effectively. Invented and patented by Sunpower, Maxeon technology is the most advanced type of solar cell available today. Sunpower’s entire range and BenQ’s Sunforte panels are the only panels on the market available with Maxeon technology. 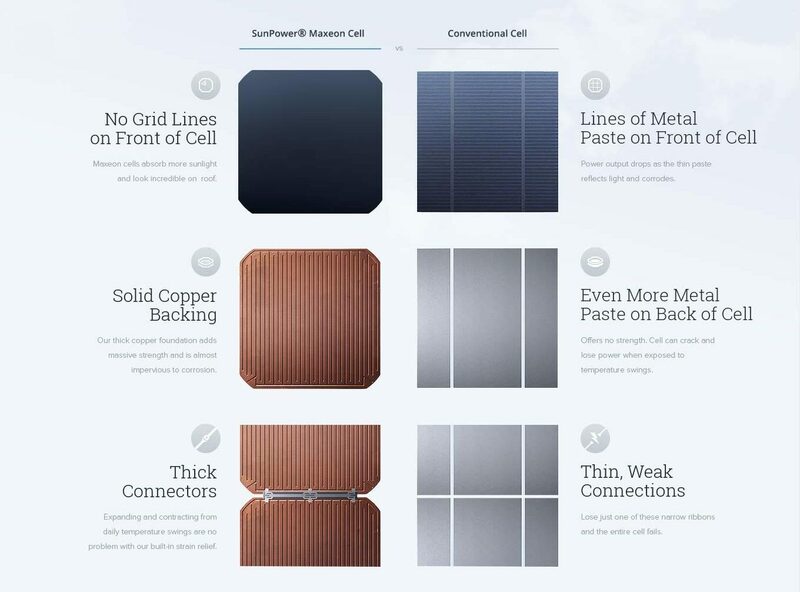 Thanks to the explanation above from Sunpower, you can see why these high quality panels are more durable and generate much more energy over their lifetime. Sunpower are so confident in the technology they give a market-topping 25-year full cost of replacement warranty and they’re top of the independent field testing carried out by Photon Magazine in Germany. Sunpower take care of their customers seriously. It’s not just lip service. Their products are only available through accredited installers, who are rigorously scrutinised before being allowed to use their products. And their panels must be registered through the Sunpower warranty system so the company knows exactly where they’ve been installed. Sunpower also carry out a customer service check with every system owner to maintain the quality of their service. So it shouldn’t come as much of a surprise that, currently, most of our customers choose Sunpower. Over time, all solar panels lose some of their power. An average silicon crystalline panel will lose about 15% of its power over 25 years in a typical UK climate. However this can vary between panels and through installation methods. Causes of degredation - Wohlgemuth, J. "Reliablity of PV Systems." Proceeding of SPIE, Aug. 2008. Maxeon technology cells are the most durable. Independent testing shows they’ll lose just 2.5% of their power over 25 years. The diagram above shows the main causes of power loss. Corrosion: Even panels manufactured to the highest quality will eventually let in some moisture under the glass and weather seals. And for those with fragile thin strips of aluminium across the front of the cells, it doesn’t take much corrosion to break the connections that carry the sun’s energy to your system. 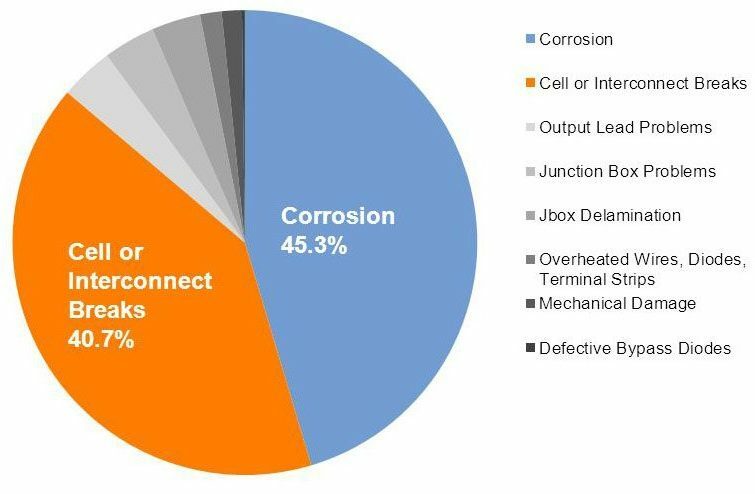 Interconnection breaks: Changes in temperature expand and contract the aluminium connections between cells. Over time it will stress them. Along with corrosion, eventually some connections will break, adding resistance to the conductivity in a panel, which decreases the amount of power a panel can generate. Can I trust my solar panel warranty? Solar panels come with two different warranties: performance and product. However. these vary in clarity and unscrupulous installers often miss-sell based on their misleading assurances. Product warranty: This guarantees against any manufacturing defects, i.e. physical faults with the panels. On average 10-15 years long, these warranties usually offer a replacement panel or refund the cost of a replacement panel but don’t cover scaffold, installation or the investigation to find the fault in the first place, which can be the most expensive part of all. The exception (again) is Sunpower, who offer a 25-year product warranty covering the full cost of replacement, including sending a replacement panel, labour and scaffold or other access requirements. Performance warranty: Sometimes called degradation warranties, these guarantee how much power a panel will retain after 25 years. All MCS certified panels require a warranty that guarantees they will retain at least 80% of their power after 25 years. Some manufacturers offer better warranties that guarantee more than 90% of their power after 10 years and 80% of their power after 25 years. Check the data sheet of the panels you’re interested in for complete clarity on this issue. Guaranteed for 25 years? Often we hear of solar salespeople focusing on the 25 year performance warranty and neglecting to mention the product warranty. This can also cause problems because if you have a degradation issue with a panel after the product warranty has run out the manufacturer may say, for example, that the degradation is caused by excess corrosion due to breaking down of the sealant, they may then say that this is a product fault and the product warranty has lapsed, leaving you with a low producing panel and no warranty covering the fault. Other degradation: The remaining issues that cause degradation are much smaller but still contribute to the overall loss of power from panels. These are less prominent in better quality panels which have better quality components and sealants.